They are carriers of many pathogenic micro-organisms, their droppings also pose a major sanitary threat to yourself and your family. Timber joist, walls and finishing elements to your home. Insulation material, water pipes, plastic, wood and electrical wiring, telephone cabling. Rodents live and thrive in a wide variety of climates and conditions and are often found in and around homes and other buildings. You don’t normally see rats but their signs are easy to detect. Holes – Rat holes are about 70mm in diameter and can be seen outside in garden beds, next to sheds. Runs and Smear Marks – rats establish certain routes when travelling to and from their nesting site, these black greasy smears left by their fur rubbing against surfaces. Droppings – rat droppings are between 10 and 20 mm long and often found concentrated in runs. Nests – Sometimes can be found inside, under electrical appliances, areas where less frequent by humans. Gnawing – Rats will continually gnaw down their front teeth on most materials such as electrical cables, timber fixtures and plastic pipework. Our professional technicians will survey and assess the infestation and advise on the most effective treatment to your rat infestation. A baiting programme with the most reliable rodenticides with tamper-resistant bait stations that will keep bait away from children, pets and non-target animals. How can I prevent rat infestation? Rats are adaptable, persistent and breed rapidly to produce a large rat infestation, by proofing your home or business will make it less attractive for rats. Keep your home in good repair; rats can squeeze through gaps of 15mm to gain access. Cut back weeds and overgrown areas, keep lawns short and tidy, remove any build-up of waste to eliminate nesting sites for rats. Rats are good climbers; make sure you trim back any vegetation in contact with the roof, repair any broken or loose tiles. Ensure drain covers are fixed correctly and in place, rats have known to climb up downpipes to gain entry, use a fine wire mesh fixed to base of the pipe. Roof rats nest outside in trees and dense vegetation, inside roof rats prefer to nest in roof space, tops of walls. Fur smooth and soft, usually black or grey. Pointed with excellent sense of smell and taste, eyes are large and prominent. Norway Rat is sexually mature at 2-4 Months. Non-Burrowing, nests mainly in walls, roof space, vines, trees, excellent climbers, normally seen in high places. 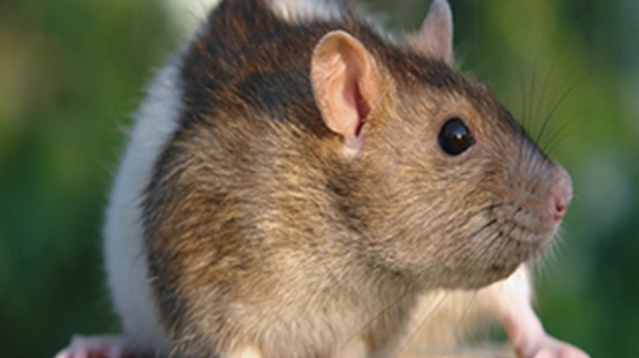 The brown rat, also referred to as common rat, street rat, sewer rat, one of the best known and most popular rats. Fur harsh and shaggy. brown and black on upper head and body, grey or off white underneath. Norway Rat is sexually mature at 3-4 Months. Burrows, lives inside, will come from the sewers, swims well, outside will nest in various places, refuse tips, gardens, hedges.